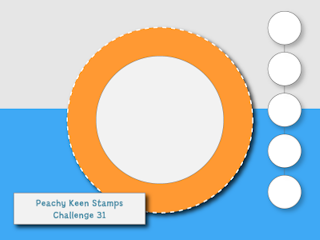 Peachy Keen Stamps Sketch Challenge. The cartridges used were Old West for the Barbecure sign cut with my Gypsy at 2 1/4" X 3/4" with the hide contour feature selected to block out the word "Barbecue", Create a Critter for the Horse cut at 2 1/2" and the Stars cut at 3/4", and Independence day to cut the Circular Flag which is the circle behind the horse. I cut the outside of the circle with my Gypsy and the hide contour feature selected at 3 1/4" then I cut the inside of the circle at 5". I know, it sounds weird but I wanted the center to be larger than the normal center size. 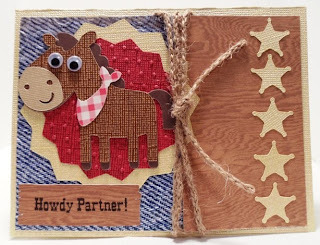 I used 100% Jute string for the bow, a couple of google eyes, Denim and Wood grain paper from Joanne's and my Howdy Partner stamp from my Joy's Life "Lot's of Pun" stamp set. OH My Goodnes! This is amazing. I have been eyeing this cartridge for a while and its on my wish list and this just made me want it 100x more. Love this so cute! Thank you! This is one of my favorite cards so far. This card is so cute! I love the papers you used, and the horse is soo adorable! You did a great job! Good Luck on the Peachy Keen Challenge! I love your card!!! I love denim and it looks perfect here! Thanks so much for playing along in the PKS Challenge this week, good luck! What a cute card! I haven't used my cricut much to make cards, but I see a lot of very cute cards! Your card is sooo cute! Ruthie told me that she saw the cutest card using my stamps, so I had to come see. She was right!! I love it! I love the horses plaid necktie too. The wood-like paper is so cool! Adorable card, and great job with this challenge! So happy you could play along with us at Peachy Keen Stamps! ADORABLE! LOVE IT!!! Thanks so much for playing along with PKS! Good luck!